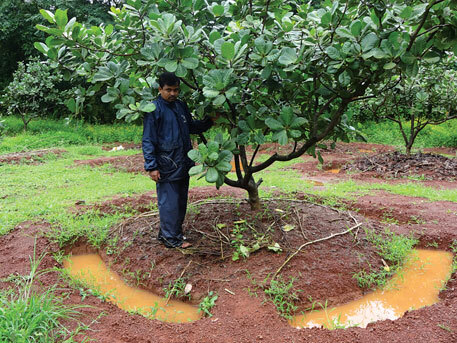 FARMERS SANJAY and Vrushali Pundit of Kondiye village in Ratnagiri district had never bothered to pluck cashew apples from their 1,000 cashew trees. “We allow the ripe fruit to fall and then pluck the cashew nut in a day or two,” says Vrushali. But next year, they can expect a busier harvest time. Food processing giant PepsiCo has offered to buy their cashew apples. The company plans to use cashew apple in place of more expensive fruits such as pineapple and pomegranate to prepare mixed fruit juice sold in India under the Tropicana label. According to media reports, V D Sarma, vice president for global procurement at PepsiCo India, said that the company always tries to use locally produced fruits to reduce costs for itself as well as consumers. While the couple is glad for the offer which could add about Rs 15,000 to their annual income, they are concerned it will increase labour costs. “The company will only accept fresh fruits without any bruises. We will have to get the fruit plucked and sorted, which may raise our costs,” says Vrushali. According to the Directorate of Cashewnut and Cocoa Development, Maharashtra, the largest cashew-growing state, produces 150,000 to 200,000 tonnes of cashew nuts every year. But what does not get noticed is the fact that cashew apple, whose annual production from the state is around 1.2 million tonnes, is not contributing to farmers’ income. The perishability of the fruit makes it a difficult crop to process. Unlike fruits like mango, cashew apple cannot be plucked before it matures because the nut, which is the main produce, is not ready till the fruit becomes fully ripe. Plucking the ripe fruit is difficult because it bruises easily, accelerating fermentation and making it unsuitable for juicing. “To get good quality juice, the fruit must be plucked, transported and processed within 24 hours,” says Purushottam Baheti, senior manager, operations, at Exotic Fruits, a Ratnagiri-based firm carrying out processing operations for PepsiCo. This is perhaps the reason why traditionally cashew apples have been used for making feni—a form of country liquor the Konkan coast of Maharashtra and Goa are famous for. But the Maharashtra government’s ban on making cashew feni closed that option decades ago. Though PepsiCo is the first big company to start procuring cashew apple from the region, there are small factories that have been buying the fruit. However, there is a disagreement between manufacturing units and farmers over the price. While processing firms say cultivators should accept a low price because the fruit is going waste anyway, farmers say things are not that simple. Shrikant Vaidya, another Ratnagiri-based businessman whose firm Deepali Products produces around 1,000 litres of cashew apple syrup every year, agrees. “I paid Rs 5 per kg last season, but I was procuring at the factory gate. I cannot pay that price if I have to arrange for transport,” he says. Manohar Hardikar, cashew cultivator from Konde village, says that he sold his produce to a local juice manufacturer for two years for Rs 3-Rs 4 per kg, but he could never sell more than 10 per cent of the produce. The unit shut shop when farmers demanded a higher price, he adds. Both farmers say that a minimum price of Rs 5 per kg for procurement at their doorstep is required to cover for the cost of extra labour and the rejected fruit. This brings up a difficult question: is it at all possible to process a major part of Maharashtra’s 1.2 million tonnes of cashew apples at a price beneficial to farmers? In the current scenario, the answer appears to be a clear no. India produces more than six million tonnes of fruit, and only about 20 per cent is being used for making feni in Goa and Karnataka. The situation is not very different in other parts of the world. According to the African Cashew Alliance, an association of Africa’s cashew industry, Brazil, a major cashew-growing country, processes only 12 per cent of cashew apple it grows. There are other uses of cashew apple that have not become popular because of lack of awareness. One such area is biofuel. “There is not much enthusiasm regarding manufacturing bioethnol from cashew apples. The first project, taken up jointly by the Plantation Corporation of Kerala and Directorate of Cashew Research, Karnataka, is yet to start functioning,” says Venkatesh N Hubbali, head of the Directorate of Cashewnut and Cocoa Development, government of India. We are grower of cashew pl i have collected now want to sell cashew send details. Thanking you . Please I need Hybrid Cashew Nuts can you get some for me please?